When we think of straight talk, we think of speaking candidly and openly. We imagine saying what we mean so that other people understand us perfectly. We imagine a world of insightful exchanges, where people from all backgrounds talk to each other in constructive ways. We imagine a world where everyone takes responsibility for clear, honest, and open communication. 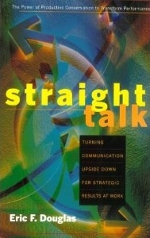 Straight Talk is aimed at building such a world. It is aimed at building a world of competent communicators. But what does competent communication mean? What do we mean by competent communicators? We mean more than the ability to use language well, or to articulate one’s thoughts and feelings clearly. We mean more than knowing how to get a message across. We mean more than being able to listen well, although that too plays a part. When we talk about competence in communicating we really mean three things. First, we mean understanding that we all have our own styles of communicating – and that our different styles affect everything we hear and say. It means acknowledging that these different styles can lead to misunderstandings. In the long run, it means developing and expanding our repertoire of communication styles so that we can communicate easily and fluidly in any situation. Second, we mean understanding and avoiding the pitfalls that lie in wait as we process and convey information. This means understanding that these pitfalls occur in a moment’s time and that we are thus unconscious of them. It means acknowledging that how we process information can be changed and made more effective by challenging the way we think. Third, we mean applying a set of ground rules that allows us, whether as two people or as a group, to acknowledge barriers to communication and overcome them. This means recognizing that competence in communication does not come easily. It means acknowledging that ground rules, like rules of the road, are necessary to avoid crashing into one another while we try to communicate. Fundamentally, then, competence in communication means challenging and changing the ways we listen and talk to one another. It means turning some of our traditional ideas about communication upside down. At the heart of this concept is the idea that competency in communicating is different from competency in any other field or endeavor. That’s why it’s so hard. We’ve all experienced what happens when two unskilled communicators get in a room together and fling assertions back and forth like Ping-Pong balls. Ping: That’s how we do things at XYZ Corp.
Pong: Well, that’s not how we did things at ABC Corp.
Ping: Well, that’s how we do them here. Pong: That’s not the way it should be done. Asking questions – especially good questions – is a sign of competence in communicating. Flatly stating your opinions is a sign of incompetence. Curiosity is a reflection of competence. Certainty is a reflection of incompetence. Good communicators realize that knowing all the answers isn’t a sign of competence. It’s most often a sign of incompetence. How do you teach competent communication? The Straight Talk survey is a powerful tool on its own, and a great way to introduce Straight Talk. The blog and its newsletter are designed to teach the basic principles of Straight Talk over time. The video course is a great way for individuals to learn about Straight Talk at their own pace. The quickest way to teach Straight Talk is our trainer’s guide, which includes a participant handbook and exact script to host your own training session. The Straight Talk book provides the common ground to help teams gain competency in communication as quickly and effectively as possible. Our communication is key. I have read a fair amount here, not a lot and I’m no expert, but so far I agree with everything . My test results were exacting and illuminating. I have passed it on to others and done some comparisons. Again, spot-on results. I’m encouraged to go further. I want to learn more and more than enough to modify my own if needed and to look for ways to determine others so we can communicate more effectively. For me, communication is the root of everything we do, make, achieve, and become. I’m moving on.